Saturday morning at Mars Bar, originally uploaded by pamhule. Another iPhone shot. 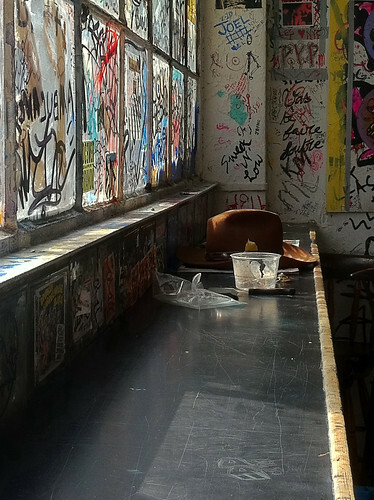 This time through a window at Mars Bar on 1st Street in New York with the camera's High Dynamic Range (HDR) function on. The iPhone's HDR feature really does a nice job of adequately adjusting the exposure in different parts of the image. Here, for example, the light in the window would have been over-exposed and blown out. 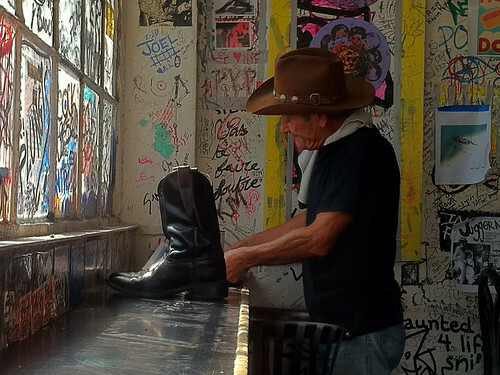 I took a shot earlier tin the morning as well when the cowboy hat was alone in the bar sans boots and man. You can see that show below the fold. WIthout the Hat, originally uploaded by pamhule. Saturday morning breakfast at Mars Bar? Hm. I prefer the interior to the exterior. Such a landmark in NYC, I hope it stays here a long time.